Your students will love learning all about these TWO COOL creatures! Penguins are birds that can't fly with a funny waddle! 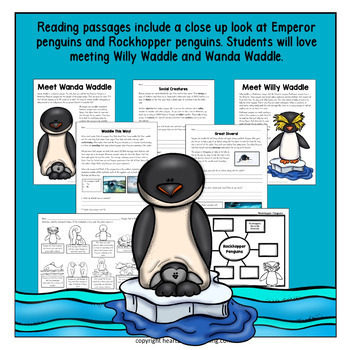 Waddle this way as we take a closer look at penguins and polar bears! 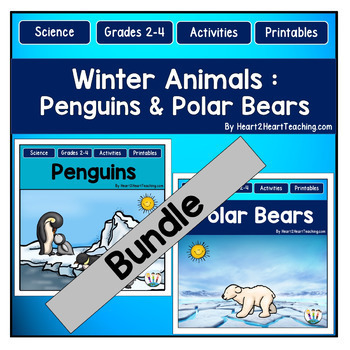 This BUNDLE includes everything you need to teach, investigate, and learn all about penguins and polar bears with a close-up look at Emperor Penguins. 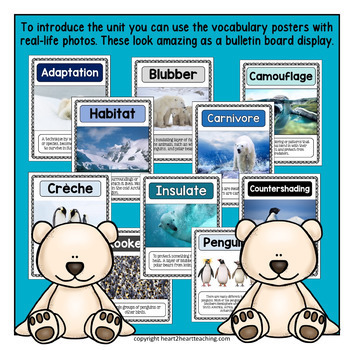 Introduce the six vocabulary words with the real-life photo posters included. You could post these posters around the classroom and have students travel around to match up and define the words in their flip flaps or use as a center activity. These posters are excellent for a bulletin board display too. Next, have students read the informational articles all about Polar Bears with a special look at Knut, a world famous polar bear. There are several activities for students to complete after reading the articles, such as comprehension questions, fact or fiction activity, organizers, and cloze passage. Also included is the life cycle of a polar bear diagrams, fact or fiction activity, and much more! You could have students work with a partner or in small groups or as a center/station activity. 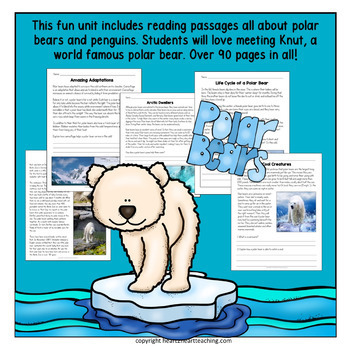 Have students complete the 5-page Polar Bears Flip Booklet. I usually have them do one page at each center or station. They can use the articles as a reference source to help them complete the pages of the booklet. Lastly, they cut, color, and assemble the booklet. Flip up books can be glued or stapled inside their interactive notebooks, file folder, or a 12x18 piece of construction paper folded like a book cover.